Trinity Community Gala is coming! Trinity Community Gala will be held on 24th and 25th August. We're celebrating Trinity this time by holding a photography competition, sponsored by Lomond Park Co. Ltd. Could you win a prize? Drinks, nibbles and nattering. Come and join us! Our Pastoral Care Group has gathered some new resources for those who need some extra help. Building relationships, building community – finding God in dialogue with the world and its people: read more about our new church development plan. Recordings of the 10.30 service each Sunday are available on CD. Please ask at the Church Office or browse our selection at the back of the church. From Edinburgh city centre follow Dundas Street to Canonmills where you turn left at the traffic lights. Follow this road as it passes the Royal Botanic Gardens Edinburgh (on your left) and Heriot’s Sports Field (on your right) until you reach the traffic lights at the junction with Ferry Road. Turn right onto Ferry Road and then first left. Travel down South Trinity Road which becomes Stirling Road, passing Lomond Park on your right. At the end of Stirling Road turn left and the church is approximately 50 metres on the left hand side. 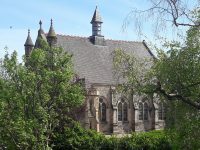 Number 23: The route is from Morningside via Hanover Street, Inverleith Row to Lennox Row terminus which is situated beside Trinity Bowling Green and Lomond Park Tennis Club. Turn right when you get off the bus and cross over Stirling Road. Walk along Lennox Row and turn right at the junction with Netherby Road. The Church is about 150 metres down Netherby Road. To launch Christian Aid Week, the Moderator of the General Assembly of the Church of Scotland, Rt Rev Susan Brown, is donning her walking boots to take part in the annual Tay Bridge Cross Challenge on Saturday 11 May.